As I am sure many of you know, due to the lingering soreness in my right knee and the brutal winter, I haven’t been running much these days. Fortunately, my knee doesn’t feel as bad as it used to when I run, indicating it is healing. Slowly, but surely I am making progress. I just have to be patient. 1) Doing leg lifts on the floor, face up, with ankle weights about 3 times per week. I tend to do about 4 sets of 20 reps for each leg. This helps maintain muscle and can stimulate healing of the injured area. Besides this I use resistance bands to strengthen my hips and do the bicycle maneuver to strengthen my abs. I do these exercises even when not injured, but usually a little less often, and fewer sets. 2) For the past few weeks, about once or twice per week I would stuff a 23 lb medicine ball into my backpack and walk around the neighborhood with it. It should go without saying that this gets tiring after a while, making a 2.5 mile walk feel more like an 8 mile walk. The idea behind this is that if I can’t run or walk very far, I should increase the intensity of short bursts of exercise. 3) Similar to the idea above, I would often juggle at home with my heavier balls, mostly my 1 lb balls, and sometimes my three 2.25 lb Exerball set. As my arm endurance improved, I eventually started joggling outside with the heavy Exerballs. Three 2.25 lb balls may not sound like much, but doing this for a little over 2 miles a few days ago was very tiring, and is a new record for me. Doing this while going up hills is especially grueling. This mostly upper body cardio can be challenging, and inside or outside helped my heart maintain its endurance capacity. Unlike joggling with very light balls(1/3 lb or less, what I normally use), my arms feel the burn while doing this instead of my legs. 4) If the weather outside was too nasty, or my legs didn’t feel like running, I would do stair-climbing for 20 to 30 minutes. I continue to do this sometimes, but I am running more these days. 5) Besides this, I have been more strict than usual over making sure I get a recovery snack or drink immediately after a workout, even bringing energy bars with me for short runs which I don’t usually do. Delaying replenishing depleted blood sugar, and/or fluids and electrolytes may slow the healing process or even increase the risk of re-injury. 6) What I don’t do is about as important as what I do to help heal this injury. Basically, I’ve done no speed-work, little to no hill running(until recently), no squats(they bother my knee), no stretching, and nothing beyond 16 miles(did 16 nearly 2 weeks ago). Sometimes it’s a little hard to resist trying to run fast, but all the ice and snow outside makes it difficult to run fast for long. Besides this, no drugs, no pills, no herbs, no voodoo, no “therapy” based on pseudo-science. Thanks to this regimen, and being patient(which isn’t easy! )I am happy to report that my mileage has greatly increased this week. And it seems all my neighbors and acquaintances I ran into while joggling around town were about as thrilled as I was. “Where were you? !” many of them were asking. I’m not back to where I was before, but I am slowly getting there. I can’t wait until spring! Warning: If you are injured, don’t try out any of the exercises I am doing before seeing a sports medicine doctor or therapist or finding out what kind of injury you have. If you don’t know what kind of injury you have, doing any of these things may make it worse. Fortunately for me, this seems to be just a bad case of runner’s knee, nothing too serious. 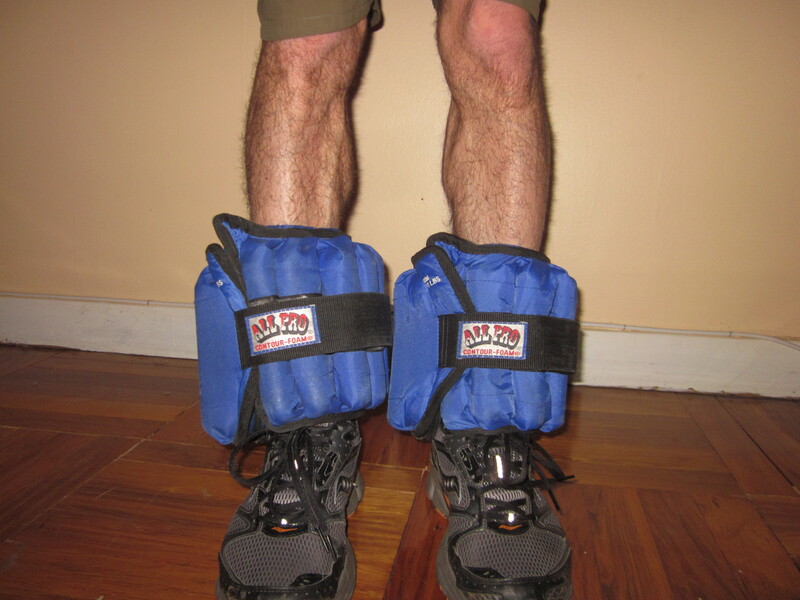 A sports medicine doctor I consulted a long time ago suggested the ankle weights exercises. If you’ve had a similar injury and want to share some tips, please go right ahead! 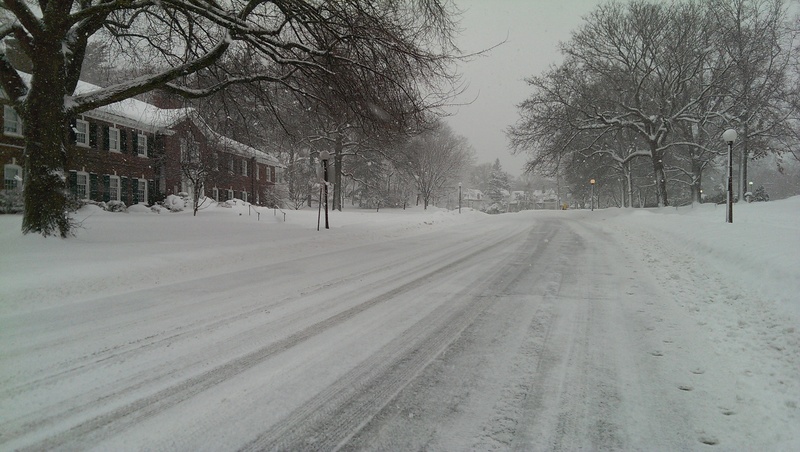 This entry was posted in fitness, running and tagged ankle weights for runners, Exerballs, healing a knee injury, heavy backpack walking, heavy ball joggling, knee injury, knee injury recovery, medicine balls, Ralph Waldo Emerson, Ralph Waldo Emerson quotes, runner's knee, running injury, snow Westchester county, snowy New York, sports medicine. Bookmark the permalink. Hope you’re all better soon! Thank you, Katherine. I hope so too, just have to be patient and not do anything too crazy for a while. I may need a personality transplant though to succeed at this. I hope you’re doing well too. Argh, injuries are so annoying! It’s good to see that you are doing some (well many!) sensible things about it though. I hope you get better soon! Thank you so much for your support, Chicly. I just ran 16 miles a few days ago, so I keep improving. I ran 40 miles last week, which is almost back to normal. I hope you make a full recovery also, and are able to workout like you used to. Patience is king. Thanks for coming by!